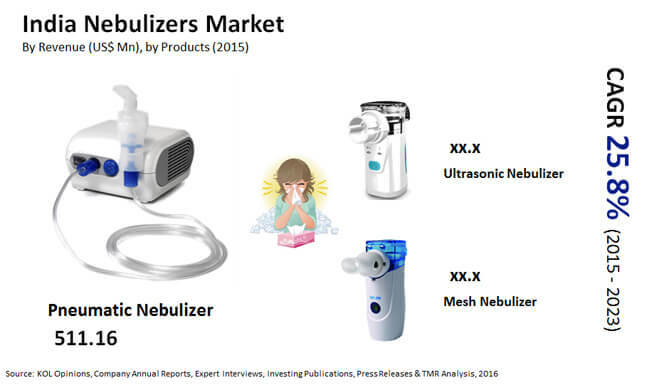 The influx of enterprises has rendered the India nebulizers market highly fragmented. Despite the intense competition prevailing among the companies, CareFusion, Omron Healthcare, and Philips Healthcare emerged dominant holding approximately 52% of the market in 2014. Looking forward, the market players are forecast to aggressively invest in research and development to innovate products, subsequently strengthening their position in the India nebulizers market. The strategies adopted by the players have been significantly contributing to the market’s growth. According to Transparency Market Research (TMR), the India nebulizers market is projected to exhibit an impressive CAGR of 25.8% between 2015 and 2023. Expanding at this pace, the market is projected to reach INR4.7 bn by the end of 2023, from a valuation of INR575.6 mn in 2014. Presently, the north zone exhibits comparatively higher consumption than any other zones in India. As the prevalence of chronic obstructive pulmonary disorder (COPD) is skyrocketed due to the cold climate and the increasing level of pollution. The incidence of the ailment is not likely to diminish any time soon. Considering the efficiency of nebulizers in curing such ailments, the demand for the same is poised to surge in the zone at 27.5% CAGR during the forecast period. Based on product type, the pneumatic nebulizer segment currently hold dominance in the India nebulizers market. As per the World Health Organization (WHO), deaths due to lung ailment in India are in continuous rise. Furthermore, in the last few years the prevalence of acute respiratory disorders such as COPD, asthma, and cystic fibrosis has increased at a significant pace. According to the National Health Profile 2015, over 3.5 million cases of acute respiratory infections were reported in 2014, reporting a spike of almost 30% since 2010. Nebulizers are considered highly effective in the treatment of these conditions as they enable converting liquid medicine into aerosol, which can easily reach into the patient’s lungs when inhaled using an inhaler. Due to the benefits they provide in administering medication, these medical instruments are likely to get more popular in the coming years, thus boosting the India nebulizers market. The prevailing trends are indicative of the increasing incidence of COPD in metro cities such as Kolkata, Vijayawada, and Delhi. The condition is further aggravated through air pollution, vehicular pollution, escalating number of smokers, and the increasing population. Hence the demand for nebulizers is significantly higher in the metro cities of India. Furthermore, the increasing investment to boost the healthcare infrastructure in India has paved way for aggressive research and development activities. “Technological advancements ensuring effective treatment for respiratory disorders will result in extensive usage of nebulizers in India,” said a lead TMR analyst. This will make India an opportunity-rich market for nebulizers.